My recent visit to Morston Hall alerted me to the delight that is Norfolk Peer potatoes. If Galton Blackiston - and it turns out several other chefs as well - can champion them as new potatoes that have a superior flavour, then that was reason enough to explore. And since they are carried by Tesco - at least in Norfolk - what could I do but immediately obtain a pack for my own research? Potatoes are sort of out of vogue right now, with their starchy carb hit held to be the primary culprit for expanding waistlines. 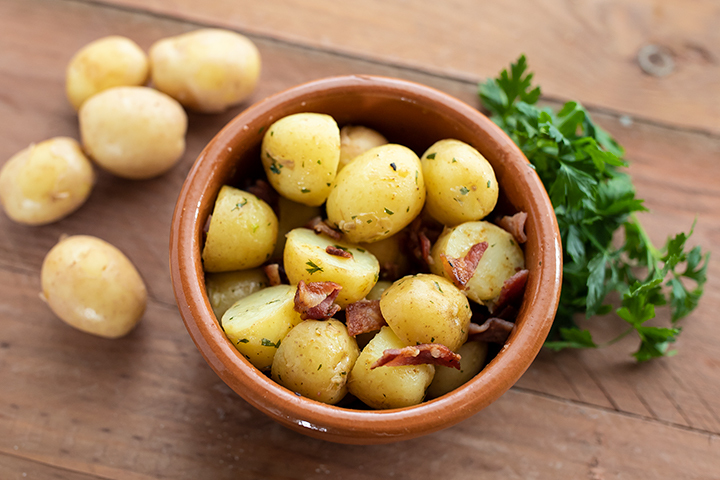 Low carb diets are all the rage, and that means fewer potatoes. I don’t know if that’s just an impression, and potato sales continue pretty much unabated, or if it is a real thing. But from my perspective, if something enters the category of the ‘occasional treat’ then all the more reason to seek out the best tasting representative to make the most of the opportunity. The other thing that really appeals is that using Norfolk Peers makes potatoes seasonal again. June to September is the season for these new potatoes. It means they’re as fresh as you’re going to get unless you visit the farm yourself. And I love things that have their season. I don’t want asparagus in November. It’s not quite the same with potatoes because they can be stored naturally to have a long eating season. But for new potatoes at least, it would be good to bring the seasonality back. Call it my little quirk. I decided that my first test with the Norfolk Peers would be a simple potato salad. Most potato salads are sad affairs, for all that we’re quite addicted to them. Overcooked and soggy potatoes smothered in enough mayonnaise to swamp any flavour that might be left. The key to a great potato salad is perfectly cooked potatoes - fully cooked so that they’re meltingly soft - but not overcooked so they become saturated and mushy. The second key is to give it a dressing that adds complementary flavours that enable the principal ingredient to shine. If you’re going to really get the measure of a potato’s flavour, it’s a good place to start. The mayo-heavy version is really a creature of the USA. For my version, I decided to go more French, with a simple vinaigrette dressing with a little mustard and finely chopped parsley. I couldn’t bring myself to peel new potatoes, even though there are advantages to doing so for a potato salad. I simply cut the potatoes in half and cooked them to soft, made a vinaigrette with good quality virgin olive oil, white wine vinegar, Dijon mustard, finely chopped parsley, salt and pepper. I dry fried some bacon until it was dark and crispy - it would have ideally been streaky bacon, but I had back bacon to use up and it worked almost as well. Once the bacon is crispy, you chop it up into small pieces. When the potatoes were fully cooked, I drained them and left them to steam a few seconds to get more of the water gone. Then put them back in the hot pan and mix together with the vinaigrette, leaving them for a couple of minutes. Doing it this way means that the flavours of the dressing get taken on by the hot potatoes in a very satisfying way. Once that has stood for a couple of minutes, mix in most of the bacon and serve with the remainder sprinkled on top. And the taste? Fabulous. If you care about the flavour of your potatoes, there’s no reason why you wouldn’t make these your go-to variety for anything involving new potatoes. And now I want to try out other ways of showcasing them as an ingredient. Of course, for me this is a very sustainable proposition - these potatoes are grown very locally to me, so not only am I enjoying a superior product, but I’m also eating locally and supporting a local producer. That’s all very well, but I’m anything but averse to seeking out some of the best produce from far and wide, so it would be hypocritical of me to make too much of local as a virtue in this case.